Pappa Roti is a coffee shop well known for its delicious coffee caramel bun. Contrary to what maybe most of us are thinking, Pappa Roti is originally from Malaysia. Roti is a Sanskrit word that means bun. This coffee shop has been spreading like mushrooms here in the UAE so one day I finally decided to give it a try. I went to their branch in Marina Mall and I know that I actually arrived at Pappa Roti when the smell of fresh coffee-mocha-caramel tickled my nose. I ordered the regular bun, as this was my first time and did not want to be that adventurous. I was really impressed how it was served. 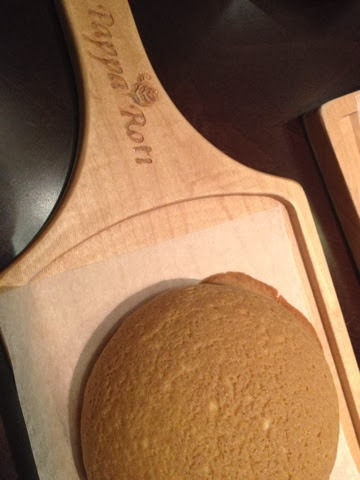 It was served on a wooden platter, which is very unique if I may say. Now comes the taste test. I couldn't believe it when I started slicing the bun, it was like I was slicing through nothing and that's how soft it was! 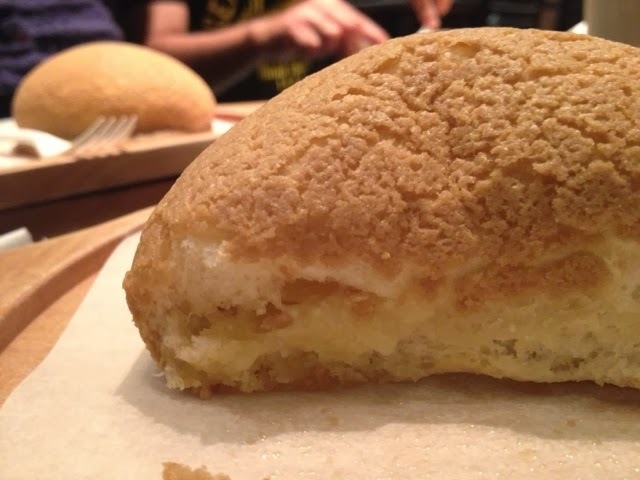 The outer layer of the bun was crispy, but the inside was as soft as a cloud. It was also filled with a layer of cream in it. When I tasted it, it literally just melt into my mouth and I felt like I was in heaven. OMG!!! It was divine. I could actually feel the taste buds in my palate rejoicing when I had that first bite. I ordered milk tea as well for my drinks. It was almost the same as the tea tarek from Singapore that I am addicted to. There are only two differences: First is the price. Of course tea tareks in Singapore are way cheaper than the milk tea here at Pappa Roti. Second is the presentation. 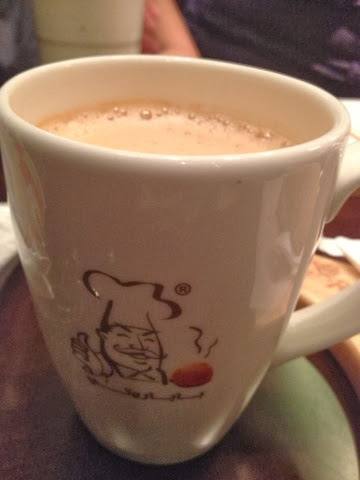 Milk tea at Pappa roti is served in a ceramic mug while in Singapore it is served in a stainless steel cup or mug. Nevertheless, the taste is almost the same. My first dine in experience at Pappa Roti was superb. It was definitely an experience well worth remembering. I assume that you guys already know what my answer will be if asked if I'll go back to Pappa Roti - the answer is a big YES! Check out their site for more information about Pappa Roti and its branches here in the UAE.